Final plans for traffic safety improvements in Porter Square were presented Tuesday, updated from a form presented Jan. 18 but not erasing fully the strong opposition by residents and cycling activist groups. The presentation had the square’s current five-phase traffic signal cycle (including one for pedestrians only, and another to leave the mall parking lot) still being replaced by a simpler three-phase cycle. A left exit from the Porter Square shopping plaza through a zebra-striped pedestrian pavilion will remain; the January plan showed it being eliminated, with the exit blocked by cement planters – a proposal called cheap and ugly by many in attendance. In addition, a pedestrian island between lanes of traffic where Somerville Avenue meets Massachusetts Avenue will remain, shifted a bit toward the T stop and widened some. The move is meant to better distribute motor vehicle traffic and allow for implementation of buffered bike lanes, which have gridded white paint separating bicycle and motor vehicle traffic. The buffered lanes are planned for both sides of Somerville Avenue. The project would run “over the next few months [during] construction season,” he said. 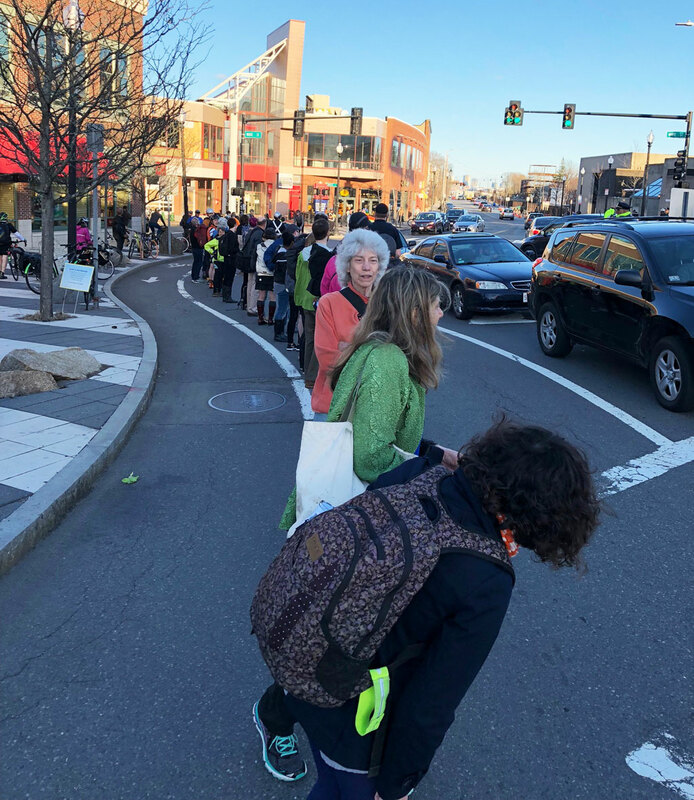 Barr said plans were altered based on input from the community and an April 26 protest by the Cambridge Bicycle Safety Group, but he still received criticism from cycling activists who felt their message went unheard. “Worthless,” is what one angry attendee called the plan, and city councillor Quinton Zondervan asked senior traffic engineer Patrick Baxter repeatedly why there could not be plastic flex posts – the primary demand of the April protest – where the city planned to put buffered bike lanes. An April 30 council order, though passed with some debate, also hoped for more extensive steps toward bike safety. Baxter said trucks coming trough the snaky area would shear off posts in the curves, drawing criticisms from one upset cyclist that the city was “prioritizing trucks over bikes.” As part of the April protest, people formed a human wall in the Somerville Avenue bike lane buffer area to prove protected lanes were possible – and cars and bikes passed by without incident, using the lanes on either side of them. Changes to the square were spurred by two deaths in 2016: Psychotherapist Marcie Mitler, 63, was hit by a car at 5:56 a.m. Feb. 18 while walking at Somerville Avenue and White Street, and died later at Massachusetts General Hospital; Ironwood Pharmaceuticals employee Bernard “Joe” Lavins, 60, was hit by an 18-wheel truck at 8:08 a.m. Oct. 5 while bicycling on Massachusetts Avenue across from the shopping plaza and pronounced dead at the scene.